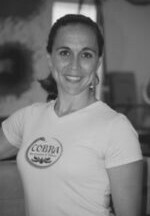 An instructor of gymnastics, dance and snowboarding for 24 years, Shelby is thrilled to be the owner of Cobra Gymnastics & Dance Center! Beginning her dance career at age 4 and gymnastics at 10, movement has always been an integral part of expression and healing for Shelby. After coaching in MA, VA, WY, MT, CO and WA, Shelby is happily coaching all levels of gymnastics classes at Cobra including the USAG Junior Olympic & Xcel girls competitive team. Her main dance focus is Middle Eastern and African Dance and she is one of the founding members of the Rutland Bellydance Troupe, Sisterhood of the Silk Road. She is a certified teacher in the Gypsy Caravan Style of Tribal Bellydance. Currently a professional member of USA Gymnastics and a mother of three, Shelby finds absolute joy in teaching and encouraging children and adults to aspire to their fullest potential!